Speak to Captain Undak in Dorgesh-Kaan. To start, you must speak to Captain Undak, who can be found northeast of Dorgesh-Kaan's marketplace. Ask him if you can help with anything, and after chatting with him for a while, he'll say that you need to help him protect the goblins from H.A.M. members. Accept his offer to go to the nursery, which can be found by going upstairs and entering the building nearby. Once there speak to Mernik. Go outside and talk to Torzek, and try to calm her down. Ask her some questions until she tells you that each of the children had a different meal. Each child had two different meals. Ask the kids inside the nursery what they ate yesterday. The possible types of food are: Wall beast fingers, Crispy frog legs, Frogspawn gumbo, Green gloop soup, Frogburger, and Bat shish. Anything eaten by the kids inside can't be poisoned, so after asking all of them you'll know which two foods were poisoned. Tell Captain Undak that you know which foods are poisoned and he will tell you that you need to find out which food vendors are using poisoned ingredients. Go downstairs to the marketplace; talk to the vendors of the food you think is poisoned, and ask them about their merchants. Find out which merchant they have in common, that's your man! Note: Before proceeding, you may want to take equipment for a battle with a Food Seller, level 50. Find said merchant (it varies from person to person, but all of them can be found south of your current location) and talk with him, choose the option that says: "This is the one, Captain". You'll have to confirm, do so since if you are wrong, you will have to pay 5,000gp compensation. If you've got the right man a cutscene will appear, after it choose the option to attack him. In the middle of the battle, the merchant will pray and Zanik will arrive to help you out. When you're about to kill him, the captain will stop you. After this, you'll have a chat with Zanik about what happened to her. You will take Zanik's place (she can be controlled in the same way you would control your character) in her story. Jump to the Goblin Statue that is next to an "Ork Statue" and a "Statue". Keep jumping until you make it to the statue holding a bowl. A cutscene will appear. Keep jumping until you make it to the ledge and pick up the crossbow (which has a built-in grapple). Click on the spear nearby to use your crossbow to grapple on it and make it to the throne. Pick up the pendant that can be found there. Jump down and look into the bowl to trigger a cutscene. Walk to the west side of the room and the statues will move to let you pass through. Enter the portal at the west end. Your ability to control Zanik has ended. You will find yourself talking with Zanik, agree to go to speak with the council. Now walk to the very north of Dorgesh-Kaan and climb the staircase to trigger a cutscene. After you go through the dialogue, Zanik will disappear. Agree to help find her; you will need a light source. Now walk south to the Agility course and go down the stairs. Go to the southwest of the cave and Zanik will be there. Talk with her and choose the option to sit down, then say nothing. Keep saying nothing until she talks with you. Then go through the dialogue until she agrees to go back to the council. She'll be sentenced to being banished from the city. Talk with her again and then talk with Captain Undak. Ask him about his next task, and you'll receive a set of H.A.M. robes to infiltrate into their base and find their next target. Talk with Johanhus Ulsbrecht who will tell you the location of Sigmund's H.A.M. base. Note: Before proceeding, you may want to take food, a weapon, and prayer potions. A fight with Sigmund (level 75) and Zanik (level 75, must be fought several times) is coming soon. 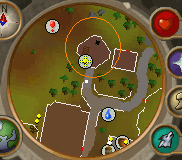 Teleport or walk to Ardougne and go to the windmill just south of the Fishing Guild. Without removing your H.A.M. clothes, talk Milton the Miller and tell him the password. Now go down the just-revealed ladder. Open the southeastern door in the main room and go through it. Talk to the guard near the cell until he tells you what day it is. Look at the notice board nearby and see which guard's turn it is. Go back to the main room and pickpocket that guard. If you talk to Sigmund he'll recognize you and kick you out of the base, appearing in a field to the south-east. This may also happen if any of the guards catch you when you are helping the goblin. Enter the southwestern door in the next room, crawl through the hole, and open both doors from the inside to unlock them. Go back to the guard and give him the letter. Go through the door and take the key from the floor. Grubfoot is locked in a cell; unlock the cell door with the key, go in and talk to him. Tell him you'll get him out of there, also tell him to wait until you distract the guard. Move to the north of the guard, then talk to him to distract him, soon Grubfoot should be in the next room. Now tell him to wait at the west door whilst you distract the guard. Crawl through the hole in the wall and you'll break some dishes. You may also use the door and click on the dishes to break them. Wait until the guard comes so that Grubfoot has time to move on. Head to Grubfoot's room and tell him to follow you. Head out of the eastern door, making your way towards the double doors to the north. A guard will catch you, but keep walking anyway. When you come out of the room Sigmund will appear, attack him. Soon Zanik will come to aid you in battle. After almost killing Sigmund, Zanik will attack you herself. Try to kill her, but she will regenerate. After almost killing her several times you'll be given the option to tell her to remove her pendant, click on it. She will throw the pendant and a goblin will take it, turning it into the Bandos Avatar. Zanik will try to teleport you and herself back to Dorgesh-Kaan, but her teleport will fail and you will be somewhere near said place. Walk a bit west and some rocks will fall, separating you from Zanik. Talk through the rocks and then clear the path. Talk with Zanik again and tell her you'll give her directions on where to direct her grapple. Do so and soon she will be with you. Go west to the cave exit and head North to talk with Juna, and you'll have a talk about Zanik's destiny. Keep heading north until you make it to Dorgesh-Kaan. 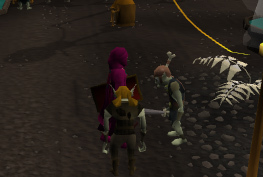 Talk with the goblin near Lumbridge Cellar to get walked to Dorgesh-Kaan. Go to the center of the Marketplace to meet with the captain again. He will tell you that a problem has happened in the city and that you should go to the council to hear more about it. Go back to the council and talk with the Scribe, agree to help him. Head to the center of the town where the obelisk is, then head east and then north through a passageway to find Tegdak, who will give you a box of artefacts for the time capsule. Go back to the Scribe and he'll make the time capsule. Go to the northeastern-most part of the city and go through the bone door to the mines. Ask Mistag to bury the time capsule. Head to the northwestern part of the city, where you'll find Oldak, the sphere seller. Talk with him and agree to help him. Head to the agility course, but instead of going down the stairs as before, go east. Talk with the goblin there to get the Focusing Chamber and the Energy Projectors, then go back to Oldak who can now be found in the southeastern tip of the marketplace, where Zanik arrived from the portal. Give him the parts and he'll attach them to Zanik's Crossbow. Now give her the crossbow, and she will tell you to go to the nursery, and talk to Mernik; do so. She will tell you to talk to the Ambassador Alvijar, who can be found just north of you. He will refuse your offer to take the children, go back to Mernik and talk with her. Note: A fight against a level 125 Bandos Avatar (who uses Magic and Melee attacks) and other monsters (level 50-75) is coming. You may want to take prayer potions, food, and armour. Return to Zanik and accept her offer to be teleported. 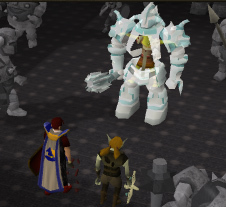 You will be in the throne room again, but now the Bandos Avatar will be there. Talk with him and a fight will start. Get his health near to killing him and then tell Zanik to use her crossbow's special attack, she will be killed before she can do it. The avatar will summon several Orks (level 75), which you must kill to be able to pick up the broken crossbow. Get the Avatar's health to red and talk with him, choose the option to use the Crossbow and finally he's dead. Talk to Zanik and choose the option to sit next to her and to say nothing. Soon she will wake up. Talk with her and give her the pendant, she will destroy it. Get out of the room by going through the portal, and a cutscene with you and Zanik being congratulated will appear. 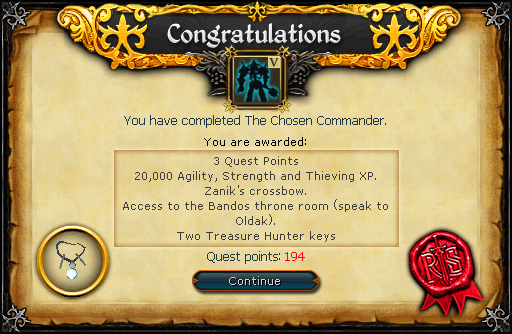 Zanik's Crossbow 20,000 Agility experience 20,000 Thieving experience 20,000 Strength experience Access to the Bandos throne room (speak to Oldak). After the quest, the Throne Room serves as an agility course, you can jump on the statues and grapple to the throne for Agility XP. The agility course gives a total of 380 XP if successfully completed. However, you can slip and fall from the statues, which does a fair amount of damage. Each individual statue gives only 2-4 xp. 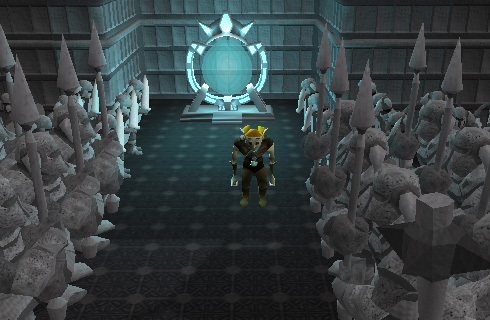 In this room you can also kill the statues, which drop different types of maces and gems, including the Granite mace. Other possible drops are mystic earth staves and earth talismans. Use Fairy Ring code "BLQ" to be teleported to Yu'Biusk, and then enter through the Strange Box. 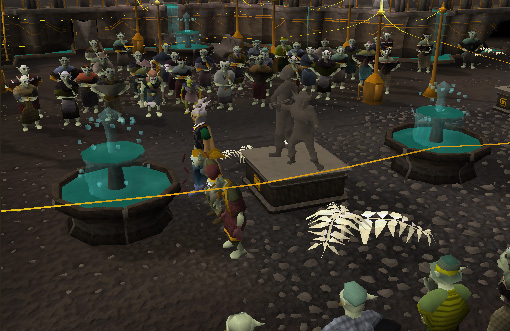 Some statues will come to life when you climb on them, and may drop the Granite mace when killed. 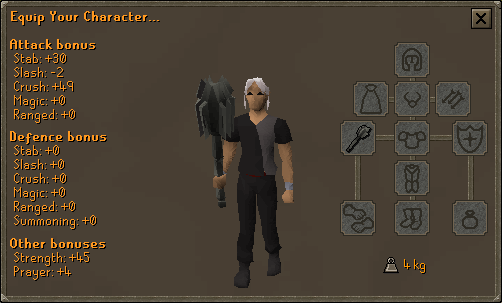 The Granite mace has a special attack similar to the Granite maul. 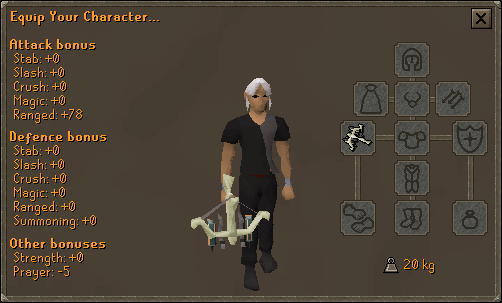 You may keep Zanik's Crossbow after the fight, it is an improved version of the Bone Crossbow, and also uses Bone Bolts. It has a special attack, which hits higher on opponents that are using prayer. [^] Talk to Captain Undak in the Dorgesh-Kaan Marketplace. [^] Go to the nursery, which is the building nearby when you go upstairs; speak with Mernik once there. [^] Talk to Trozek, he will say that kids may have eaten poisoned food. [^] Compare the meals eaten by the kids outside an inside; the meals eaten by the kids outside, but not by the kids inside are poisoned. [^] Go downstairs and find the vendors of the poisoned food. Talk with them. [^] See which condiment supplier they have in common, and prepare for a fight with a level 50 Food Seller. [^] Zanik will arrive and help you kill him, but the captain will stop you. [^] You will now have control of Zanik, make her go up the Goblin Statue that's next to an Ork Statue and a "Statue". [^] Make it to the statue holding a bowl and watch the cutscene. [^] Keep jumping until you make it to the ledge and pick up the Crossbow. [^] Use the spear nearby as a grapple, then pick up the pendant. [^] Jump down, and after the cutscene exit the room. [^] Go all the way north until you find a staircase, and climb it. [^] Now go all the way south until you reach the agility course, go down the stairs, and go south again. [^] You will find Zanik, sit next to her, and say nothing until she talks with you. [^] After talking with the council, talk with the captain to receive H.A.M. robes and a new task. Wear the robes. [^] Go to the H.A.M. 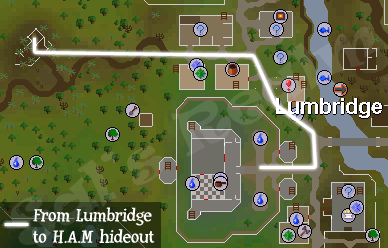 Hideout, which can be found west of Lumbridge's General Store. [^] Talk to Johanhus Ulsbrecht, who will tell you that Sigmund's base's location is near Ardougne. [^] Go north of Ardougne to a windmill, talk to the man there, and go down the trapdoor. [^] Go through the southeastern door and talk with the guard to know the day of the week. [^] Read the noticeboard to see which guard may interrogate the suspect today. Pickpocket said guard. 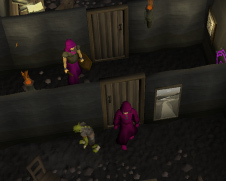 [^] Give the item you obtained by pickpocketing to the guard, pass through the door, pick up the key, and talk with the goblin inside the cell. [^] Open all the doors in that place at least once. Move to the north of the guard, and talk to him. [^] Go to Grubfoot's new location and tell him to wait at the west door. [^] Go to the kitchen and break some dishes, talk with the guard whilst Grubfoot moves. [^] Head to his new room, and tell him to follow you. Exit through the door located north of you. [^] Attack Sigmund, soon Zanik will come to aid you. [^] Zanik will attack you, you have to kill her five times, she regenerates every time you kill her. [^] When you get an option to remove her pendant, choose it. [^] Watch the cutscene and be teleported somewhere near Dorgesh-Kaan. [^] Walk a few steps west and an avalanche will occur, clear the rocks that are blocking your path, and talk with Zanik. [^] Give her directions on how where to use her grapple, then go out through the passageway west of you. [^] Talk with Juna about Zanik's destiny, then just exit through the opening at the end of the cave. 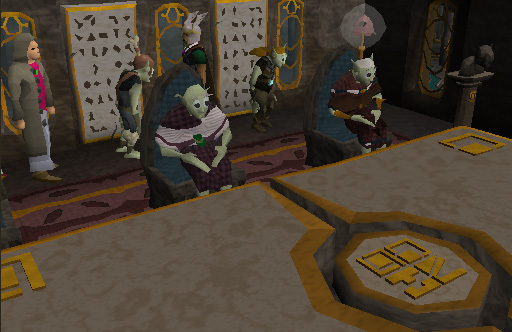 [^] Head north until you find a goblin, he will take you to the Dorgesh-Kaan mines. [^] Head to the marketplace and talk with the captain. [^] Go to the council, and after the meeting's over, talk with the Scribe. [^] Go to the center of the city, then head east and north through a passageway, and talk with Tegdak. [^] Head to the Scribe's place, and then go to the mines and ask Mistag to bury the time capsule you got from the Scribe. [^] Go to the northwest of the city, where Oldak, talk to him. [^] Head to the agility course and go east, instead of going down. [^] Talk with the goblin to get two items, then go back to Oldak, who can now be found where Zanik left the portal. [^] Give the item you receive to Zanik, and go to the nursery. [^] Talk with Mernik, then with the Ambassador, and with Mernik again. [^] Prepare for a fight against a level 125 Bandos Avatar (which uses mage and melee, and you must kill twice) and several Orks level 75. [^] Return to Zanik and be teleported by her. [^] Attack the Avatar and when you get the option to tell Zanik to use her special attack, use it. [^] Pick up the Crossbow's pieces while killing the Orks. [^] Kill the Avatar again and use your Crossbow to deliver the final blow. [^] Sit down next to Zanik and wait for her to wake up. [^] Go out through the portal, watch the cutscene, and... Quest complete!